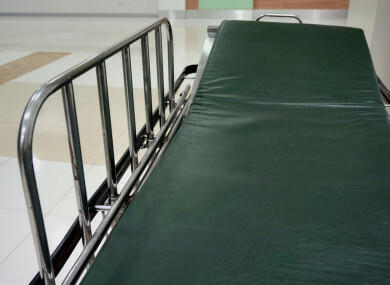 LAST MONTH ALMOST 8,000 admitted patients were forced to wait on trolleys and chairs, according to the latest figures released by the Irish Nurses and Midwives Organisation. The INMO’s monthly ‘trolley watch’ analysis shows that 7,765 people were treated without hospital beds in September. Some 68 children were among those waiting without a bed, according to the organisation. A full breakdown of the figures can be seen here. One of the 7,765 people left waiting in September was 92-year-old Gladys Cummins. The image of Gladys sitting in a chair in the Mater Hospital was shared online after Gladys’ daughter Dee contacted RTÉ’s Liveline. Dee told Liveline that her mother was forced to sleep on a chair while her children looked after her. She said it took 25 hours before she was seen. Commenting on the figures released today, INMO general secretary Phil Ni Sheaghdha said that having nearly 8,000 people waiting on trolleys should be regarded as a “national crisis” but it is “business as usual for the HSE”. Our members are telling us that they can’t go on with this number of unfilled vacancies. It’s not safe for patients and it’s not safe for staff. “The HSE simply cannot hire enough nurses and midwives on these wages. Unless pay increases, vacancies will remain open, wards will remain understaffed and things will only get worse,” Ni Sheaghdha said in a statement. The INMO has recommended that its members vote to reject the upcoming ballot on whether they want to accept the government’s proposals on pay, and if they think they are sufficient to resolve the recruitment and retention crisis. In response to today’s figures, the HSE said that Emergency Departments (ED) are under increasing pressure as attendances and admissions continue to rise. The HSE remains committed to minimising delays for patients, and to ensuring that adequate resources are in place in Emergency Departments throughout the country. The health service added that ED nursing posts have increased by almost 20% in the last two years, with an additional 200 nursing posts in place. “The HSE continues to recruit staff to fill vacant posts,” a spokesperson said. Email “'A national crisis': Almost 8,000 people forced to wait on hospital trolleys and chairs last month ”. Feedback on “'A national crisis': Almost 8,000 people forced to wait on hospital trolleys and chairs last month ”.